Ephemera in the University's Cambridge Shakespeare Collection includes memorabilia from festivals, advertisements featuring Shakespearian quotes and references to productions by amateur actors. Charitable fund-raising on behalf of the Chelsea Hospital for Women lay behind the 1884 'Shaksperean show-book'. Contemporary writers who contributed included Robert Browning, Alfred, Lord Tennyson and Oscar Wilde, while artists such as George Cruickshank offered illustrations. 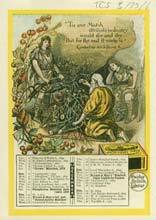 Bryant and May, manufacturers of safety matches, used a Shakespearian motif in a promotional Almanack for 1891, advocating the purchase of British-made matches. Each month was illustrated by an image from one of the plays, accompanied by a suitable quotation. Days on which notable events had occurred - such as the Tay Bridge disaster - were identified. 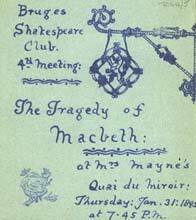 The Bruges Shakespeare Club met regularly in the mid-1890s to stage performances of plays. Copies of the advertisement for "The Tragedy of Macbeth" in 1895 lists the actors. Their names suggest that they came from the English community living in the city. The bulk of the Cambridge Shakespeare Collection consists of published editions of Shakespeare's work over the centuries. The complementary Cambridge Drama Collection supports it with many publications recording the performance of the plays in particular theatres.